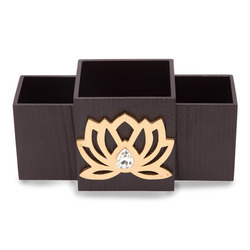 Our product range includes a wide range of flower gold cutlery holder, en cutlery holder, silver flower cutlery stand, ss3 wooden cutlery holder, lotus cutlery holder and sigma cutlery holder. Owing to perfection and quality oriented approach, we have carved niche in the industry by offering Flower Gold Cutlery. This gold cutlery has space enough to store a lot of your expensive cutlery. The gold cutlery offered by us is beautifully designed from the top quality of material latest technology by our experienced craftsmen. Our gold cutlery can also be custom-designed, as per the requirements of our customers. With years of experience and knowledge in this domain, we are engaged in offering a wide range of En Cutlery Holder. You can either put tissues or serving cutlery in the center section, our offered cutlery stand is designed by our creative workforce using finest material best techniques in accordance to the set norms of market. 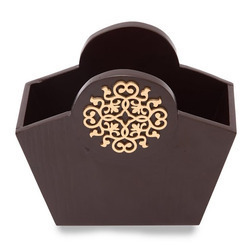 In addition, this cutlery holder comes with the mid-section having a laser cut design to lend elegance to its functionality. 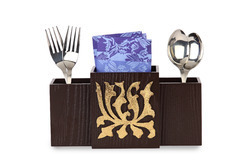 A beautifully appealing 3 section cutlery holder with a laser cut design that lends elegance to its functionality. You can either put tissues or serving cutlery in the center section. 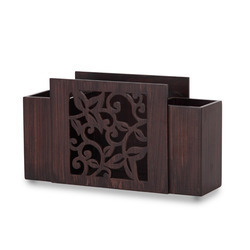 The entire wooden piece lends a rustic charm to your surroundings and is ideal for gifting. 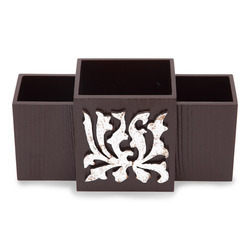 An exquisite masterpiece with an intricately designed laser motif which gives this stand an attractive royal look. A must have utility product in your dining collection that speaks volumes of your aesthetic taste in home décor. Looking for Cutlery Holder ?